IT Infrastructure of organizations is growing ever more distributed, complex and difficult to manage. To manage such networks, a log management solution is not enough. 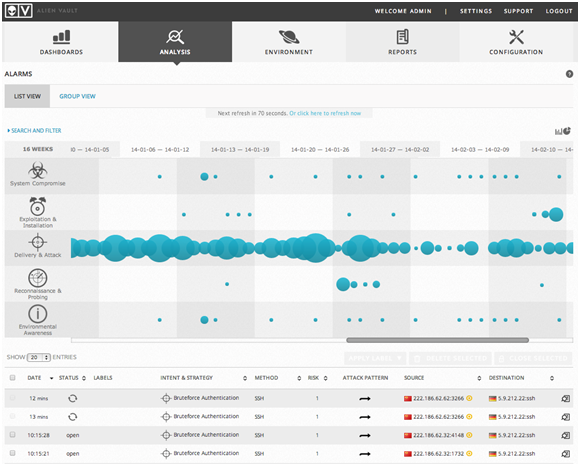 The AlienVault Unified Security Management™ (USM) platform is the perfect solution to help manage the flood of information and analyze it in real time, to find evidence of security incidents. So, in this article we will introduce you to a security monitoring solution that provides real-time threat detection and speeds incident response. The AlienVault Unified Security Management™ (USM) platform provides all of the essential security controls required for complete security visibility, and is designed to enable any IT or security practitioner to benefit from results on day one. 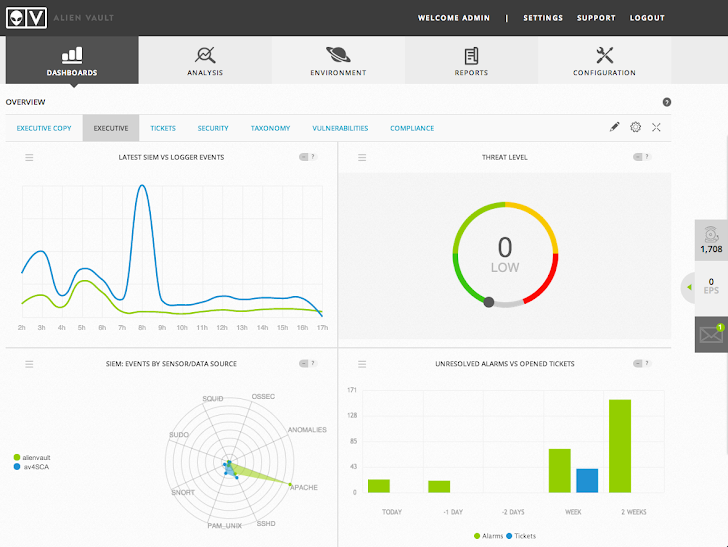 Powered by the latest AlienVault Labs Threat Intelligence and the Open Threat Exchange™ (OTX)—the world’s largest crowd-sourced threat intelligence exchange—AlienVault USM delivers a unified, simple and affordable solution for threat detection and compliance management. 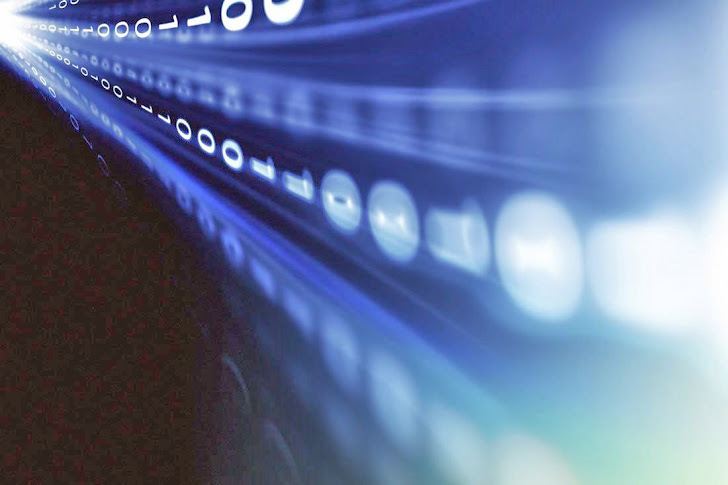 Understanding the sensitive nature of IT environments, USM includes active, passive and host-based technologies so that you can match the requirements of your particular environment. All of AlienVault’s built-in security controls are pre-integrated and optimized to work together out of the box. 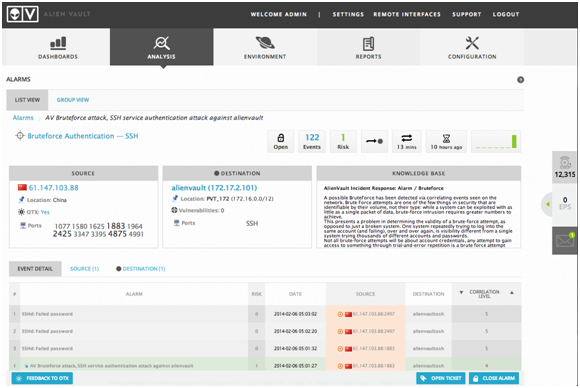 Within minutes of installing the USM product, AlienVault’s asset discovery features – active network scanning, passive network monitoring, asset inventory, host-based software inventory – will provide visibility into the assets on your network, what software is installed on them, how they’re configured, any potential vulnerabilities and active threats being executed on them. By building in the essential security capabilities, AlienVault USM significantly reduces complexity and reduces deployment time. With a single platform, AlienVault USM automatically identifies important audit events in real-time, reports them and alerts on events that warrant immediate action. From file integrity monitoring to IDS to log management - USM makes compliance easier. Not only do we provide the tools you need to be compliant, USM gathers the information you need and generates the reports to give to auditors. For distributed networks, AlienVault’s All-in-One Extended appliance provides local detection with global reporting and response. Deploy up to five sensors and provide local asset discovery, vulnerability assessment, behavioral monitoring, and threat detection. Correlate local events with global threat intelligence. 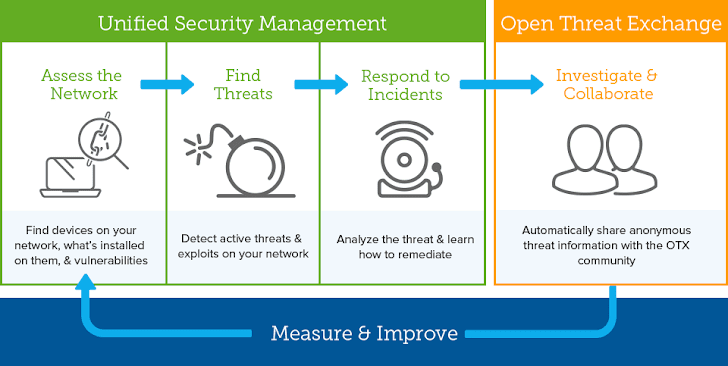 Apply business logic to security events to prioritize investigation efforts. Measure, manage and report on compliance status. Additionally, AlienVault USM Standard and Enterprise products are ideal for larger, distributed enterprises that require centralized SOC (Security Operations Center) management and visibility. The USM Standard and Enterprise products provide the ultimate deployment flexibility and scalability by separating each of the USM components – Sensor, Logger, Server – into dedicated physical, virtual, or cloud appliances. AlienVault OTX is an open information sharing and analysis network that provides access to real-time, detailed information about incidents that may impact you, allowing you to learn from, and work with, others who have already experienced them. OTX was developed for IT practitioners responsible for security who don’t want to continually deal with the same security problems as their peers without the benefit of lessons learned. Unlike closed, invitation-only information sharing and analysis networks (e.g., FS-ISAC, Infragard, ISAC), OTX provides real-time, actionable information that is open to anyone who chooses to participate. This allows IT practitioners to achieve preventative response by learning about how others are targeted, and then employ the right defenses to avoid becoming victims themselves. With USM you can achieve true security visibility in minutes, not months - If you've liked what you've seen, you can download a free 30 day trial or you can schedule an in depth demo on the AlienVault website.